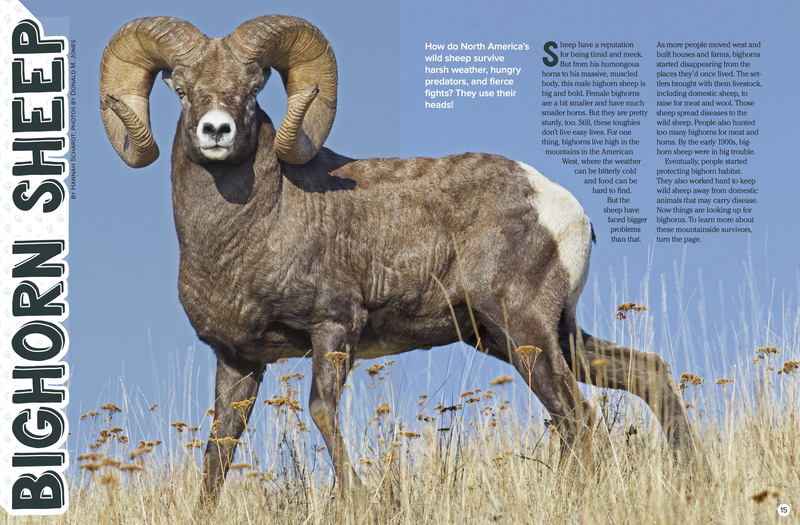 How do North America’s wild sheep survive harsh weather, hungry predators, and fierce fights? They use their heads! Sheep have a reputation for being timid and meek. But from his humongous horns to his massive, muscled body, this male bighorn sheep is big and bold. Female bighorns are a bit smaller and have much smaller horns. But they are pretty sturdy, too. Still, these toughies don’t live easy lives. For one thing, bighorns live high in the mountains in the American West, where the weather can be bitterly cold and food can be hard to find. But the sheep have faced bigger problems than that. As more people moved west and built houses and farms, bighorns started disappearing from the places they’d once lived. The settlers brought with them livestock, including domestic sheep, to raise for meat and wool. Those sheep spread diseases to the wild sheep. People also hunted too many bighorns for meat and horns. By the early 1900s, bighorn sheep were in big trouble. these mountainside survivors, keep reading. Many animals—including most people—don’t like to hang out on steep, rocky ledges. A misplaced foot could mean a deadly fall. But for bighorn sheep, climbing a mountain is as easy as a walk in the park. Thanks to their powerful legs, they can leap as far as 20 feet from ledge to ledge. Excellent eyesight helps them spot the best footholds. And their hooves—tough on the outside, soft and padded in the middle—are great for gripping the sheer sides of the mountain. All this adds up to one mighty mountain climber. In fact, a bighorn can scramble up a steep mountain as fast as 15 miles an hour. For a person, that would be an all-out sprint! Male bighorns are called rams. And, when there’s a ewe (YOO), or female, to fight over, ramming is what rams do. If two rams choose the same ewe, they may start a fight that looks a little like an old-fashioned duel. Starting far apart, they turn to face each other. Then they rush forward, crashing their heavy horns together again and again. Fights may last for hours until one ram finally gives up. Of course, most animals couldn’t spend hours slamming their heads together. But a bighorn ram’s head is built for bashing. His horns can weigh as much as 30 pounds. That’s as heavy as all the bones in his body combined! And he has a thick, specially shaped skull to help protect his brain. 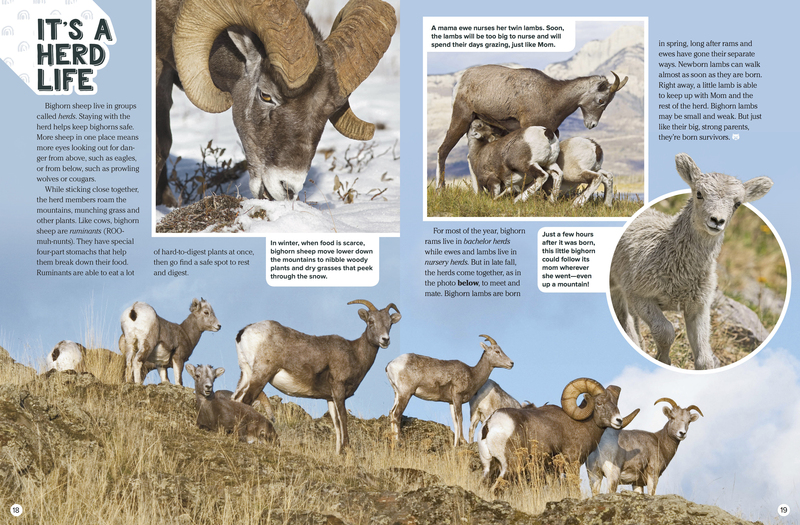 Most of the sheep in this story are Rocky Mountain bighorns. Two other kinds of bighorn sheep also live in North America. Sierra Nevada bighorns are endangered and found only in a California mountain range called the Sierra Nevada. Desert bighorns live in the deserts of the American Southwest and northern Mexico. But bighorn sheep aren’t the only wild sheep in North America. There’s also the Dall sheep, found in western Canada and the northwestern United States. Its horns are pretty big, too. But they curve outward rather than down and around. And Dall sheep are both smaller and lighter in color than bighorns. Bighorn sheep live in groups called herds. Staying with the herd helps keep bighorns safe. More sheep in one place means more eyes looking out for danger from above, such as eagles, or from below, such as prowling wolves or cougars. While sticking close together, the herd members roam the mountains, munching grass and other plants. Like cows, bighorn sheep are ruminants (ROOmuh-nunts). They have special four-part stomachs that help them break down their food. Ruminants are able to eat a lot of hard-to-digest plants at once, then go find a safe spot to rest and digest. For most of the year, bighorn rams live in bachelor herds while ewes and lambs live in nursery herds. But in late fall, the herds come together, as in the photo above, to meet and mate. Bighorn lambs are born in spring, long after rams and ewes have gone their separate ways. Newborn lambs can walk almost as soon as they are born. Right away, a little lamb is able to keep up with Mom and the rest of the herd. Bighorn lambs may be small and weak. But just like their big, strong parents, they’re born survivors. 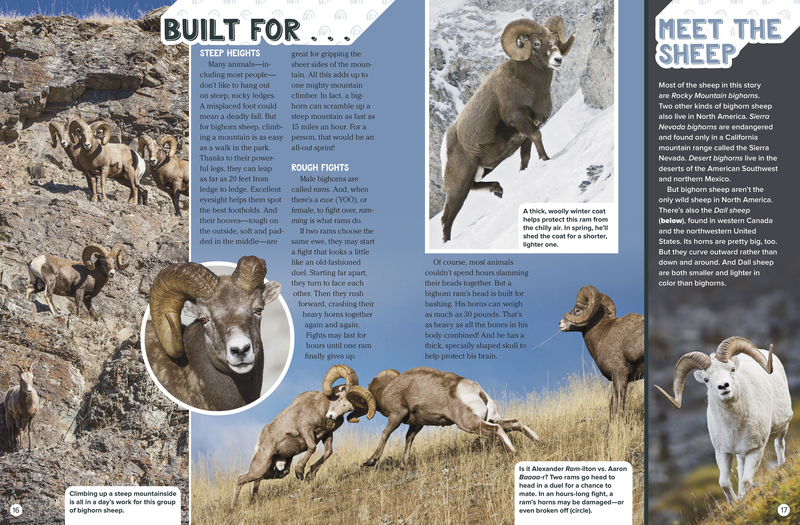 “Bighorn Sheep” appears in the March 2018 issue of Ranger Rick magazine.